Unzip 'Prohits_update_v6.x.x.tar.gz' file in the same directory as the previous version. "Prohits_update". Update 'ProhitsMascotParser.pl' from Prohits/MascotParser/scripts/ to the Mascot /cgi/, if you have setup Mascot. Make sure that the first line of the file is correct (full version). Login a sudo user to Prohits server, then run the following command line. All search parameter sets may need to modify before submit a new search task. Login ProHits Virtual Machine as root (password should be 'prohits' if you didn't change it). Following above steps to update ProHits. Thanks again to our users, in particular to Jean-Philippe Lambert, Brett Larsen, Brian Raught and all Gingras lab members for multiple suggestions and for testing new functions. The integration of tools for Data Independent Acquisition was done in collaboration with the groups of Hyungwon Choi, Nuno Bandeira and Alexey Nesvizhskii. Export to ProteomeXchange via MassIVE was enabled through Jeremy Carver and Nuno Bandeira at UCSD. • Facilitation of data deposition in ProteomeXchange through the MassIVE repository at UCSD. 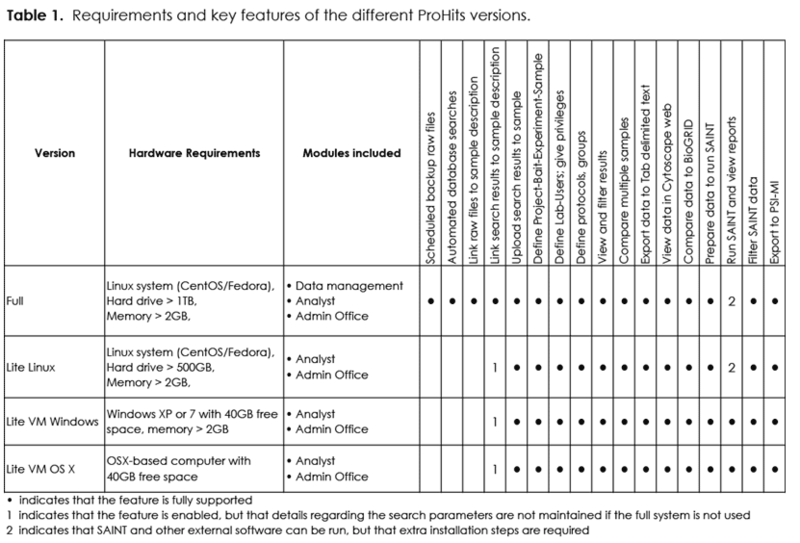 The following two tables summarize the different versions of ProHits that are now available, and the new features implemented in ProHits since the 2012 publication. Thanks again to our users, in particular to Steve Tate, Tharan Srikumar, Brian Raught and all Gingras lab members for multiple suggestions and for testing new functions. The integration of SAINT in the virtual machine implementation of ProHits was done in collaboration with Hyungwon Choi and Alexey Nesvizhskii. 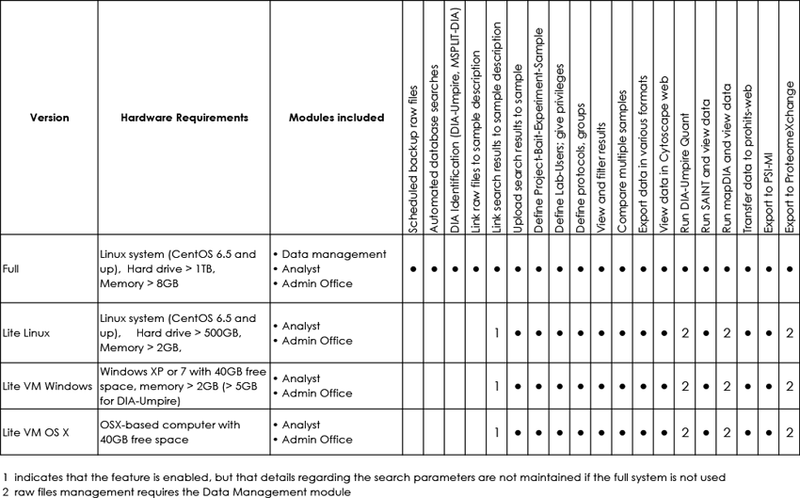 Distribution of the Lite version of ProHits (consisting only of the Analyst module and associated Admin Office) as a Virtual Machine implementation. The ProHits Lite VM can be installed on either Mac OSX or Windows PC computers. 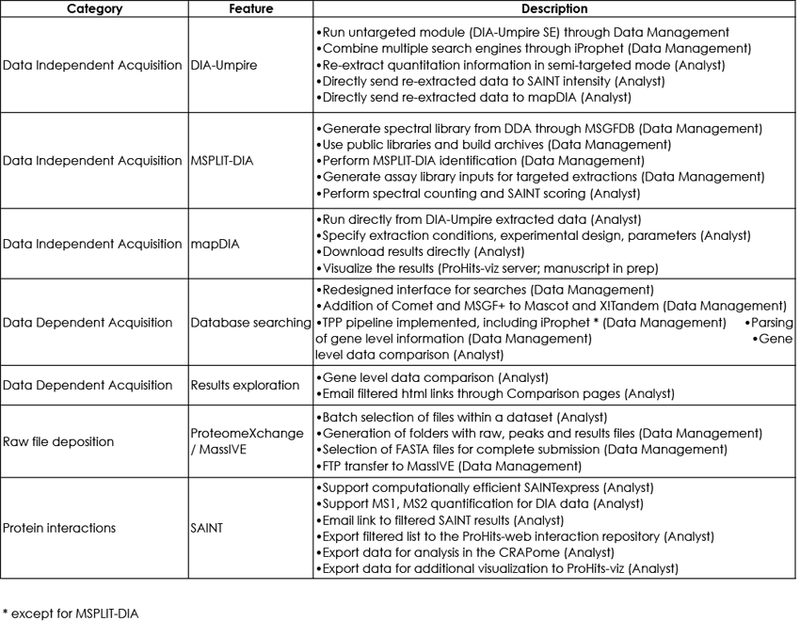 ProHits Lite VM comes preinstalled with SAINT, an internal protein database, and Cytoscape-web. 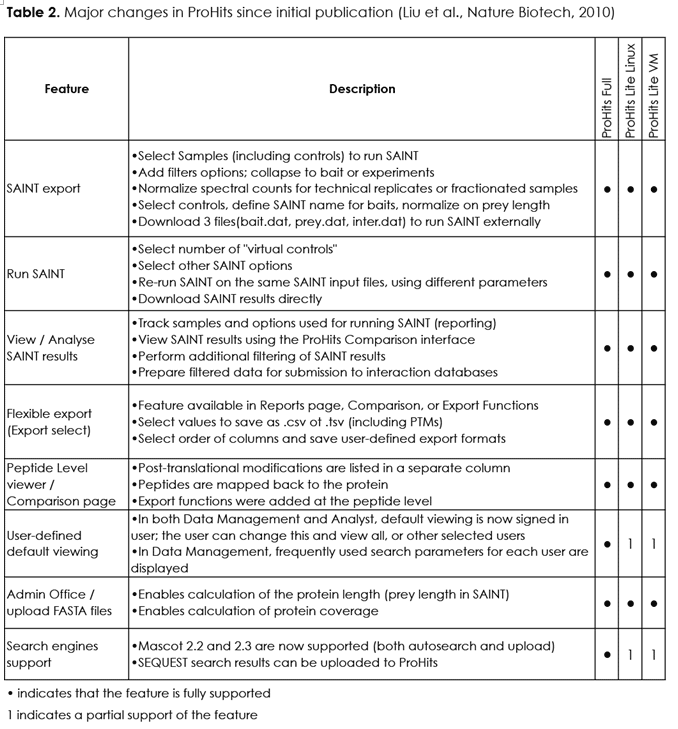 The following two tables (from manuscript by Liu et al., Curr Protoc Bioinformatics 2012) summarize the different versions of ProHits that are now available, and the new features implemented in ProHits since the initial publication. We developed a web-based interface from which SAINT input files can be uploaded and analysis parameters modified. The interface can be used as a stand-alone version allowing for files generated both within or outside of ProHits to be analyzed. We also developed a fully integrated web interface within ProHits for running SAINT and tracking all parameters and SAINT results. In a first step, the user selects (in a page similar to the Comparison entry page) all Baits, Experiments or Samples and specifies which are the control samples (other options are available) in order to create the input files for SAINT automatically. The user then has the option to download the input files or automatically run SAINT within ProHits. We have implemented viewing and export functions for the SAINT-ProHits integrated set-up. SAINT results can be filtered in a Comparison-like page and exported (Cytoscape, table, matrix and PSI-MI). Cytoscape webstart has been replaced by Cytoscape web to facilitate a more streamlined installation (no separate installation is needed on server and client sites). We added a "records log" function, which allows access to a record of user actions. SEQUEST results have been made compatible with all results Reports and Comparison view. "Report lists" can be viewed simultaneously for all users of a Project, or reports associated to a single user can be selected for isolated viewing. The default list is set to display the user's own records. A free text box was added at the "Sample" level for sample description. More sorting options (by user, group, exported version) and search functions were added for selecting baits, experiments and samples in the first step of "Comparison". The "Advanced Search" option was modified to allow for selection of user, group and export parameters. We added fields to separate search engines in the "Advanced Search" results hits list. Search results can be now exported. We now display the search task numbers for parsed hits in bait, experiment and sample status. We now support Mascot v2.3 in "Auto-Search" - including multiple database search - and have enabled Mascot v2.3 results to be uploaded. Raw file folders are now linked to search results, as are task details. SEQUEST Linux and window version (V.28 1998-2009) parsing has been implemented in ProHits "Auto-Search", SEQUEST TPP and the SEQUEST results parser. We are currently working on implementing the new version of SEQUEST (as implemented in Thermo Proteome Discoverer) within ProHits. We modified X!Tandem "Auto-Search" to support raw files larger than 1GB. We implemented a feature which allows for administrators to add protein sequences into the ProHits database by uploading protein fasta files. We modified the BioGRID overlap for proteins for which no gene ID has been found. We added more options (project ID, filters, selected ID) into the Export Comparison page, allowing for inclusion of this information in exported files. We modified the results export function to support PSI-MI XML Version 2.5 and PSI-MI TAB Version 2.5. We fixed an error occurring during results export from "Comparison" ensuring the integrity of selected bait, sample and hit properties. Thanks to all the users for suggestions, in particular to Erikjan Rijkers, Fred Elisma, Vincent Fong, Henning Sievert, Dennis Goldfarb. A function for exporting peptide locations as well as peptide modifications was added to the "Export Functions" page. A new button called "Export (select)" was added in the Comparison report pages to let users select values to be exported in a csv or tsv format. A column listing post-translational modifications was added. Within each cell, the peptide instance number (aka spectral counts) is now displayed in parentheses. Export functions were added. These are a matrix export function which lists the highest score for a given peptide as well as the "Export (select)" function as above. Each peptide is now mapped back to the protein to indicate the peptide location as well as the location of the modification(s). In the Sample page (e.g. when adding or modifying a sample), there is now an option to add a free text description of the sample. On the list page of the Individual Reports, in the "Status" column, the instrument name and search task ID (reference to the Data Management) are now listed. ProHits now offers the possibility to filter raw files by name for backing up (e.g. if you decide to save computer disk space by not saving test files). The administrator can define 'FILE_PREFIX_FILTER' in Prohits conf file. More parameters were added in the raw file converter (from ProteoWizard). Users can change parameters (e.g. ms2 with/without ms1) used to convert raw files. Users can choose to replace existing file by newly converted file. Administrators can now define custom parameter sets for raw file converting. These custom parameter sets will be organized by mass spectrometer. If a mass spectrometer has no administrator-defined parameter set, the defaults (predefined in ProHits) will be used. The frequently used search parameters are highlighted in grey and moved to the top of the list; these are specific for each user. By default, each user sees a tabulated view of his/her own Search Tasks on the Search Tasks page. This default can easily be modified by selecting search "Task" or storage "Folder". The user can further specify which project is of interest, and choose which users to query (note that only the projects accessible to the user will de displayed). Toggling has been enabled between the "Task" page and the "Results" page: The task ID number links to the Search Results page in the Search Task page, and to the Search Task page in Search Results page. Administrator can disable or enable Mascot in installation wizard. This allows the user to only use a different search engine. There was an issue with the RAW file attribution to a specific project in the previous version; this is fixed. Added "-o noserverino" in 'mount' command, since some Linux kernels set serverino as default for mass spectrometer connection. Our previous TPP parser only passed the first hit within a given hit group (Thanks to new user Dennis Goldfarb for pointing out this problem). A modified TPP parser now transfers all hits within a group when 'TPP_PARSE_MIN_PROBABILITY'> 0.05 in conf file. Debug modes added for administrator in ProHits conf file. Tested for Fedora 14 and Fedora 13. We modified the export function for SAINT. User can remove hits from reversed sequence database. If the sequence length for an unknown protein cannot be calculated, ProHits will instead report the average of all prey sequence length. We added an option to ignore protein sequence length when exporting for SAINT. Warning message in the exporting file was fixed. warning message for comparison was page fixed. We modified the function "upload Mascot" to enable "dat" and "DAT" import.